Coming to a venue near you soon? 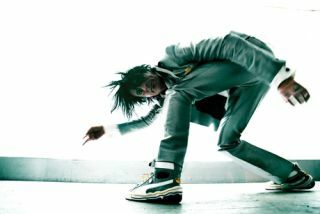 In part two of our interview with Tommy Lee the Mötley Crue and Methods of Mayhem man gives us the lowdown on collaborating with the world on new album A Public Disservice Announcement, his plans for a UK tour and how he's moving ever closer to his dream of a rollercoaster drum riser. Do you think other bands will go down the worldwide collaboration route? "I think so. I see other bands doing it and that's so cool because they'll get the same experience out of it that I had. I learnt a lot of things, one of them is that there's a lot of talented people out there. And as well, what a thing to give back. I can't tell you the enormous amount of emails I've had and they all said thank you for the most insane opportunity. I didn't realise until I got feedback that I gave somebody this experience. To me that feels good." Were there any songs that were taken in new direction after hearing the fan submissions? "For the most part things stayed pretty much on course and people added to them. But 'Back To Before' was a mid-tempo rock song and this guy in Paris sped the tempo up and remixed it and sent it back to me and I was like, 'F**k! This is way better!'. I scrapped the whole song and started over. I re-recorded it and re-arranged it and now you'd be blown away if you heard the original. He totally inspired me with some new direction for the song. I'm glad he did that because the song now is one of my favourites. They're all my favourites on the record but that one really does it for me now. It's cool how that can happen. It's such a funny process. It's always interesting to me that we all hear music differently. It's an awesome experience to hear what other people hear. A lot of times we're completely off. That was one of those that worked out really cool." How about drumming duties on the album, were they shared? "[Black Label Society drummer] Will Hunt played on 'Fight Song'. I played on all of the other songs. If there's other drum bits they're mostly percussion parts. It's funny that when it came to drummers sending in parts I think a lot of drummers were intimidated and didn't jump on. There's way more guitar players that were jumping on board. There's one French guy who submitted some really cool drum stuff, but for the most part drummers shied away from it and thought, 'Does Tommy really need more drum parts?'" Are you planning on touring the album? "Yeah. We're gonna start rehearsing shortly. The first single and video ['Timebomb'] just premiered so we're going to go do a couple of TV appearances in a couple of weeks and then get ready to take it on tour. Hopefully we'll be out in Europe in the next couple of months. That's the plan. Hopefully we can get out there. It's gonna take some time cos I'd imagine we'll start in the States and then head to Europe. If not before the New Year then definitely in the New Year." And are you any closer to realising your dream of a rollercoaster drum riser? "You know what, I'd like to do it with Mötley and I'm going to figure out a way to do it. I might do it with Methods. I think I've figured out a way to do it where you wouldn't have to drag a rollercoaster around the world at every show. That could be insane first of all and crazy expensive as well. I might shoot a performance video where I set the band up beneath a humongous rollercoaster and have that be part of the stage. So that's kinda of my plan and I'm going to see if I can pull that off for everybody."